CRAFT is the first project-based magazine dedicated to the renaissance happening within the world of crafts. Celebrating the DIY spirit, CRAFT's goal is to unite, inspire, inform and entertain a growing community of highly imaginative people who are transforming traditional art and crafts with unconventional, unexpected, and even renegade techniques, materials and tools. CRAFT 03 is themed Japanese Style. 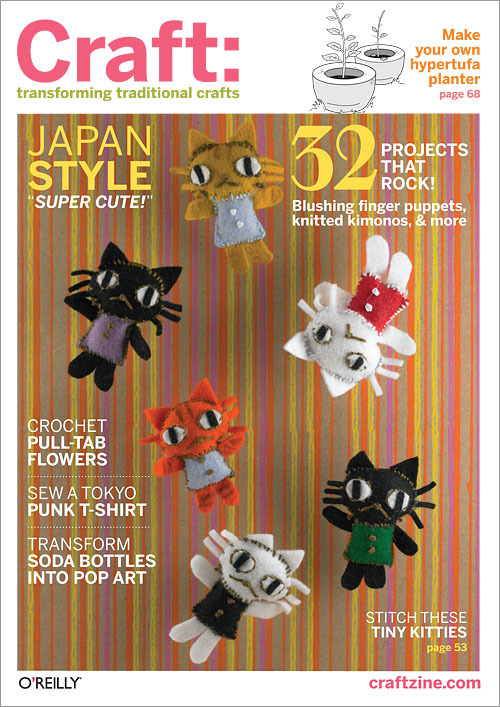 With DIY tutorials ranging from origami earrings to Sumi paper marbling to hypertufa planters to gorgeous dorodango mud balls and knitted kimonos, get ready to have no shortage of exciting crafting projects.